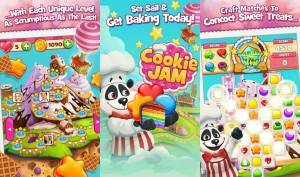 Cheats, Tips, and Level Guides for the popular mobile game Cookie Jam.Cookie Jam can be downloaded now for free in the App Store and Google Play Store. Cookie Jam Free Lives – This cheat will help you get energy whenever you want without having to wait for a timer to finish. First when you run out of lives, exit your Cookie Jam Game and navigate to your Settings. In the Settings find the Date & Time section where you can change your mobile device’s time. Once there just move your mobile device’s time ahead to however long you had to wait. Exit your settings and open up Cookie Jam. If done correctly you should notice your energy should be replenished. I am trying to get help for level 87 for cookie jam? Where are levels over 100? I need help with the kitchen timers on Level 92. Since they are in the middle of the cookies, I can’t understand where or how to beat them. Any help will be greatly appreciated! You can move the timers like you can the treats and match them with themselves. i don’t understamd how to play cookie jam level 93. Please help me w/the rules and how to clear the right hand board. Thanks a lot. I’ve tried and tried and have gotten no where. You break up the chocolate/wafers on the right hand with the striped treats on the bigger board. How do you clear the cookie cutter waffles. The timers in Level 133 are very quick and makes winning the level extremely hard. I have tried to buy extra time, but it won’t accept pay pal. I need help with level 14. Everytime I try the get 3 cakes each all in one box, I keep ending up with zero moves, and seem to never get the other pieces of cake down to the bottom of the board. How can I beat level 14? I’m on level 859.How do I get past it?